Luckyfinds: win FREE Paramore concert tickets! win FREE Paramore concert tickets! Globe is giving away free concert tickets to subscribers and Paramore fans out there. And not only that, you can also Meet and Greet them! That’s about 50 bronze tickets and meet and greet passes to 3 lucky fans. 2. Email your picture to paramore.tattoo.contest@gmail.com. In the email, please indicate your name and contact details. 3. The FIRST 50 to email us will win one ticket each! 4. The pics of the winners will be posted on the Globe Tattoo Facebook fan page. 5. We will raffle off the three (3) Meet and Greet passes. Everyone who joined the contest can win them! 6. Winners of the Meet and Greet passes will be announced on the Globe Tatto blog and on the Globe Tattoo fan page. For every PhP 5000 worth of accumulated receipts from January 16-march 9 in any of Little Asia restaurant outlets (in Tomas Morato, QC, Promenade Greenhills, or The Venice MicKinley Hill, The Fort) entitles you to 2 complimentary tickets to Paramore’s concert at the SM Mall of Asia concert grounds on March 9. Customers can get their complimentary tickets at the cashier. Redemption period: Jan 16 – March 9. Head to the nearest Little Asia branch now. With its reasonably-priced and VERY delicious food, I assure you it’s worth giving a try. You can also purchase Paramore’s concert ticket at their branches. Limited VIP tickets available. You can contact Mr. Charlemagne Lim and order via 0917-833-4223 or 0922-833-4223. 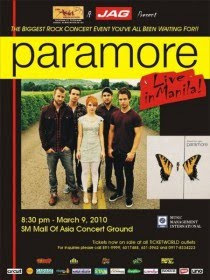 See you at the Paramore concert in Manila this March 9, 2010, 8PM at SM Mall of Asia Concert Grounds.